I wrote about perceived anti Catholic tactics by the democrats in Minnesota here. In an update I tried to give them the benefit of the doubt. Today, however, I found a picture of their latest postcard campaign on the web site for the Archdiocese of St. Paul and Minneapolis. It uses a picture of what is clearly a Catholic altar. Ok. 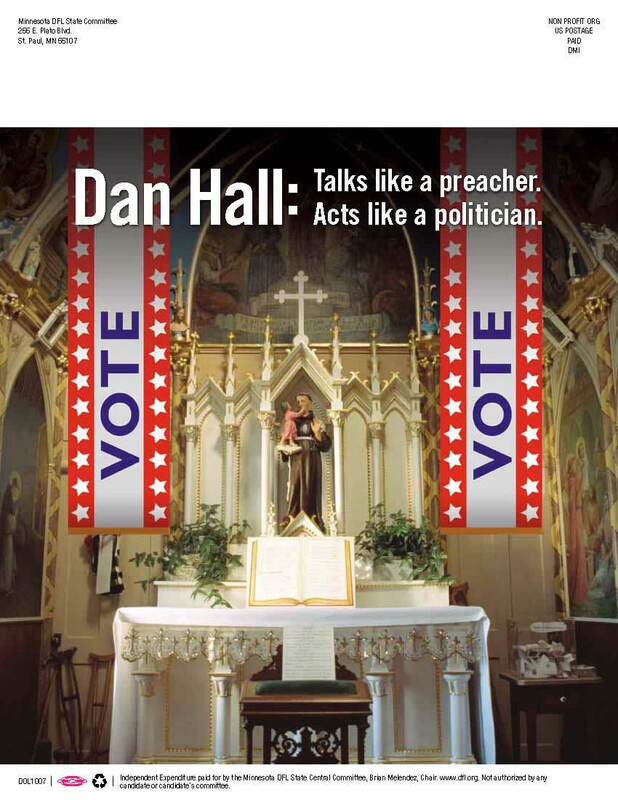 But if is only directed at Dan Hall, who is a chaplain of a non denominational Church, why use images that are specifically Catholic. Is it a coincidence that the Bishops of Minnesota mailed DVD’s in defense of marriage as between one man and one woman, to all registered Catholics? This entry was posted in Church and the Public Square. Bookmark the permalink. 3 Responses to Anti Catholic? Wow…this is a bad message. Why don’t they use a photo of the actual church and sanctuary from where Dan Hall preaches? Are we to gather from this that “Talk[ing] like a Preacher” is a bad thing? The fact that the person who chose the image didn’t recognize it was a Catholic altar, and those who received it likely didn’t know the difference, says a lot about how often they go to Mass.